Last week, I published a video interview with Ross Turk that I recorded at Open World Forum in Paris. Here’s another interview that I recorded at the event, this time with Stéfane Fermigier, Founder and Chairman at Nuxeo. In this interview he discusses how Nuxeo markets its open source product and he also provides insight into the French open source community. Merci for a great interview, Stéfane! Web sites of community-driven Open Source project are gradually becoming more professional and “marketing savvy” in their presentation. Earlier, many of these sites would be presented in a rather technical style, with lots of code and API examples and basic design. This was of course done deliberately, with the idea of highlighting technical benefits and thereby capturing the attention of developers who would then become interested in, and contribute to, the project. However, this has begun to change. Many Open Source projects are now dialing back the technical approach, focusing instead on a more professional overview of the project and clear categorization of content for users, developers and partners. In other words, these projects have now matured (or hope to mature) to the point where they also wish to gain traction with other members of the Open Source community, such as end-users or companies who might want to partner with or sponsor the project. To illustrate what I mean, let’s compare the sites of two popular CMS projects, TYPO3 and Midgard. Both are currently in the process of relaunching their websites, which makes it easy to analyze how their marketing and communications has developed over time. Midgard Web site as of today. Relaunch of Midgard Web site (under development). Midgard’s Web site is all about the code. For example, the home page focuses on developer benefits of Midgard, such as its rapid development tools for Web services and its data sharing capabilities. The home page also specifies the technologies used by Midgard, and provides links to developer tools such as the source code repository, issue tracker, mailing lists and other developer tools. Even the items in the news feed mostly focus on recent software releases. In short, this is a site by developers and for developers, and while it does provide some information for other members of the community, it’s the developer focus that stands out most strongly. TYPO3.org Web site as of today. Relaunch of typo3.org (under development). TYPO3’s Web site is less developer-oriented and broader and more inclusive in its scope (disclaimer: my company Initmarketing has previously worked with TYPO3, although not on its Website). Web site content is clearly categorized for users, developers, decision-makers and community members; this offers a way for TYPO3 to position itself appropriately for each class of visitor. The navigation shows the different entry points into the project – for example, as an extension developer, writer, translator, sponsor – and there’s also an extension repository, which also serves a barometer of project activity. In short, although this is an Open Source project that hopes to attract community developers, it moves the code and technical details one level down so that it is also attractive to other community members, such as end-users, and corporate sponsors. Note that it’s not only the messaging though, it’s also the visual design where they differ and which makes the new TYPO3 website appear more professional. Needless to say that this all has a huge impact on how the two brands will be perceived by prospective users. 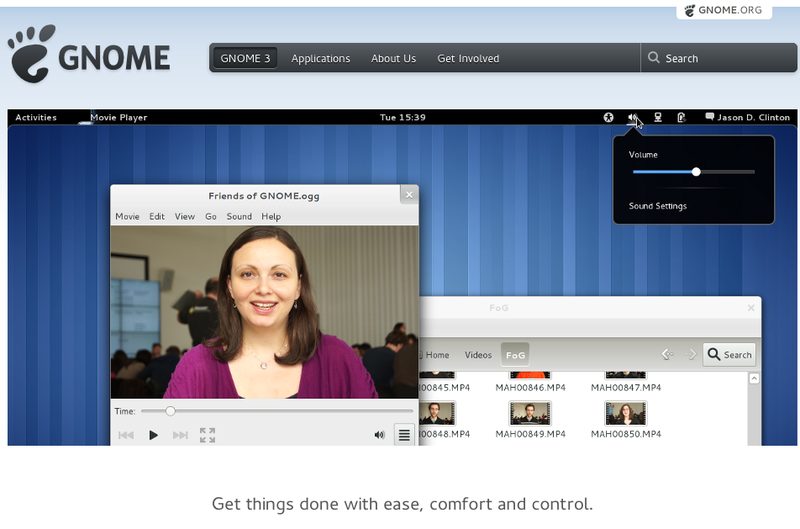 Another example of this marketing-oriented trend can be seen on the new GNOME 3.0 Web site. It’s attractively presented, and its home page focuses almost exclusively on end-user benefits … even though it’s obviously a community-driven software project that also needs to attract developers. As with TYPO3, the idea here seems to be to make the project more accessible, by highlighting non-technical benefits and thereby increasing end-user adoption. And that’s very much “marketing” thinking! If you have an Open Source project, there are some lessons in this for you. the more motivated developers are to contribute. Marketing is useful here, because that’s what it’s good at: presenting and positioning your project in the best possible light to different user segments. This doesn’t mean that your project site shouldn’t display any code; rather, it means that the code needn’t be up-front, but can be located a level or two down in the navigation tree, perhaps in a specific section for developers. At the same time, there are also companies who might want to sponsor your project, or individuals who might want to contribute to it with money or time donations. Don’t ignore these user segments; instead, make sure that your project site has useful information for all of them – for example, ways to contribute, benefits of becoming a sponsor, areas where non-programming help is needed – and make sure they feel valued and necessary to the overall success of the project. The more inclusive and all-rounded your project Web site, the more likely you are to achieve broad marketplace adoption … and that’s where the rewards really lie! You might have noticed by looking at the screenshots that none of the websites have a tagline or slogan in the header – except for the current Midgard site, which indicates the product category: “Open Source Content Management Framework”. This means that all of the above projects neglect a strong opportunity for a unique positioning and branding. I wonder what are the reasons? Is it too hard for community-driven projects to decide on the positioning or a tagline because the software is being used in very different ways? Or because the community’s decision-making processes are ineffective? Or does the community believe that its project is widely known and thus won’t need a tagline? Perhaps this is a field where OSS projects still need to mature marketing-wise. Please shell out a few minutes to help the IKS Project identify business needs for semantic CMS by participating in a survey. The results will help the EU-funded project to work towards an Open Source interactive knowledge stack. Thanks for participating in the survey and please spread the word! I’ve just published an article that explains how a PHP-based product can gain a good position in the market and be made appealing to customers by using marketing communication. The focus is on products licensed under an Open Source license. Yet, most of the recommendations also apply to proprietary offerings. The article has initially been published in German by PHPmagazin. It has now been translated to English and is available on the Initmarketing website: Commercialization of PHP Software. Rome is a great city and it will host a bunch of great people (including me 🙂 ) at November 12-13. This is when the second IKS Project workshop will take place. The goal of this workshop is to start working on an Open Source software stack that allows other Open Source projects and software vendors to leverage semantic search technologies. IKS is an EU-funded project with an overall budget of 8.5 million Euros. The first workshop back in May saw two dozen of bright Open Source CMS minds discussing a semantic stack in general. This time, it will also make sense for non-CMS-related Open Source projects and vendors to join. There will be interesting presentations from some key figures at the second workshop in Rome, such as Peter Mika of Yahoo! Research talking about “The Role of Semantics in Search”. If you’re up to joining the Open Source Web 3.0 train, then hurry up, because the October 22nd deadline for registering for the 2nd IKS workshop on semantic search is approaching quickly. See you there! For the launch of Jahia United Content Bus, InitMarketing has created a video explaining the concept. Hope you like it as much as I do. I interviewed Jeff Whatcott about marketing Drupal and Acquia at Gilbane Boston conference. He was then VP Marketing, Acquia and recently moved to work in the same role at Brightcove. Jeff is probably one of the brightest software marketing experts out there and in this interview, he shares some valuable insights. Most notably, he explains how Acquia offers extended functionality in the cloud for Drupal and builds a business around this combination of Open Source and SaaS that also leverages network effects. In a way, this could make Acquia the Google of the Drupal community.